Junctions are where two or more roads meet and represent the most hazardous areas of UK roads, particularly for vulnerable road users such as motorcyclists. 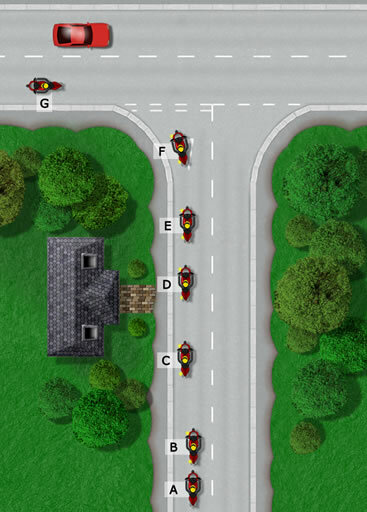 The correct method for approaching junctions on a motorcycle is detailed in this tutorial and this method, or something similar should be followed by novice riders and continued throughout a lifetime. It’s important to become confident and proficient in and around junctions, though avoid becoming too self-assured and deficient in forward planning and observation. Treat all junctions with a great deal of care no matter how easy they look, as they can often be unpredictable. 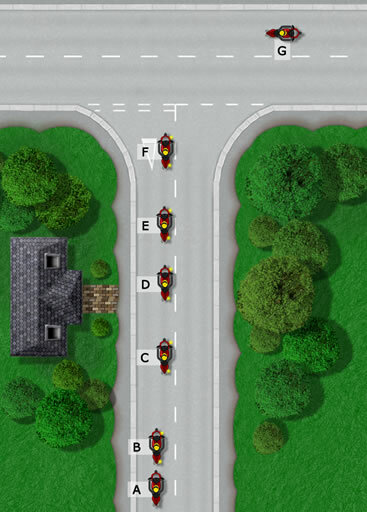 This tutorial explains the procedure for approaching junctions on a motorcycle; turning left and right at a T-junction and making left and right turns from major to minor roads. This is an ideal method for learning to ride and a technique frequently taught in preparation for the DVSA motorcycle riding tests. What Types of Junctions are there? Often road signs and road markings will be used to indicate who has priority. A minor road will often have ‘give way’ or ‘stop’ signs and junction road markings before entering a major road. If there are no signs, road markings may be used on quieter roads. On particularly quiet roads, there may be no signs or road markings. Be cautious on these as no one has priority. Busier junctions will often use lanes to separate traffic, making it easier to manage. Always use the correct lane for your intended destination. If you find yourself in the incorrect lane, change lanes only if it is legal (No crossing solid lines) and safe to do so (check mirrors and blind spot areas before changing). Avoid swapping lanes to gain advantage. Junction lanes can be hazardous for motorcycle riders. Always be aware of other traffic. Look for signals of drivers that intend to change lanes and be cautious of those that suddenly change lanes without signalling. Do not assume that other drivers will always check mirrors and their vehicle blind spot before changing lanes. Try to position yourself in the best position where other drivers can see you. Be particularly cautious of large vehicles at junctions. Large vehicles need much more room to manoeuvre and will often need to use the opposite side of the road to make a turn or straddle lanes. Give large vehicles space and time to manoeuvre. This is especially important as the driver may be unaware of you. This tutorial advises the approach to a T-junction with the intention of turning left, minor to major road, using the OSM PSL routine, along with potential hazards. A – Observation (O) – Look into your mirrors and take a brief look over your left shoulder into the blind spot. Hazards: It’s important to look into the blind spot to check if cyclists or other motorcyclists are there but not seen in your mirrors. B – Signal (S) – When you are confident all is clear and safe, signal to the left. Manoeuvre (M) – Now begins the manoeuvre part of the routine. C – Position (P) – Move over and position your bike to the left-side of the road. D – Speed (S) – Ease off the throttle and change gear to begin slowing down. E – Assess the junction to determine if it is ‘open’ – you can clearly see the major road and traffic, or ‘closed’ traffic on the major road is obscured by foliage, fences, bushes etc. F – Look (L) – You have been assessing the junction and must decide based on what you can see whether you need to stop or can continue. If you need to stop, ensure you do not stop with your front wheel past the give way lines. Ensure you look left and not just to the right before exiting the junction. Badly parked cars on the left-side of the major road near the junction may cause vehicles to drive on the opposite side of the road. G – Once you have entered the major road, ride towards the centre of your lane, check mirrors for following traffic and cancel your signals. This tutorial advises the approach to a T-junction with the intention of turning right, minor to major road, using the OSM PSL routine, along with potential hazards. A – Observation (O) – Look into your mirrors and take a brief look over your right shoulder into the blind spot. Hazards: It’s important to look into the blind spot to check if cyclists or other motorcyclists are there but not seen in your mirrors. B – Signal (S) – When you are confident all is clear and safe, signal to the right. Manoeuvre (M) – Now begins the manoeuvre part of the OSM PSL routine. C – Position (P) – Move over and position your motorcycle to the right-side of your lane. E – Assess the junction to determine if it is ‘open’ – you can clearly see the major road and traffic, or ‘closed’ traffic on the major road is obscured by foliage, fences, bushes etc. The possibility of stopping is greater when turning right as you’re crossing two lanes. F – Look (L) – You have been assessing the junction and must decide based on what you can see whether you need to stop or can continue. If you need to stop, ensure you do not stop with your front wheel past the give way lines. Remember, only exit the junction if you’re completely confident it’s safe to do so. If in doubt, stop.